Q. What is the Alabama Vessel License? A. The Alabama Vessel License (also known as the Alabama boating license or boaters license) is proof that you have met the mandatory boat safety education requirements for the State of Alabama. The Alabama Boating License appears as a "V" class on your Alabama Driver's License. Q. I do not have a driver's license. Can I still get the Alabama Boater License? A. If you do not have an Alabama driver's license you will be issued an Alabama "Vessel Only" license by the Department of Public Safety. Q. 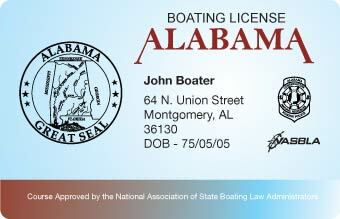 How can I get my Alabama boater license? NOTE: Additional fees are collected at the Department of Public Safety. A one-time application fee of $5, along with a $23 fee for issuance of a new license will be charged. For more information visit www.outdooralabama.com. Q. Who needs an Alabama boater license? A. The boater license is required for all boaters over the age of 12 who operates a motorized vessel on state waters. For more information on boat license requirements, consult the Alabama boating laws and regulations. A. The boater license is good for life. It is renewed automatically with your state driver's license. A. There is a one-time fee of $29.95, paid to BOATERexam, it includes unlimited retries at the final exam. Learn more about BOATERexam.com's Risk-Free Policy. Q. Is anyone exempt from obtaining the Alabama Boating License? A. Yes, there are certain exemptions from the boat safety education requirement. For more information, check out the Alabama Boating Laws page.